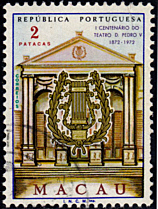 Also known as "Teatro de Santo Agostinho" or "Cinema de Santo Agostinho". Built 1858-1860 by Pedro Marques. Named in honour of Pedro V (1837-1861), King of Portugal. 1873 addition of facade. 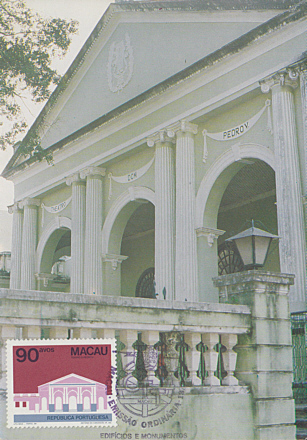 1915-1929 used as a cinema and renamed "Teatro Ma Gau", later "Cinema Macau". From the 1930s again used for live theatre, and adult entertainment shows. Closed in the 1980s. Re-opened in 1993 after major restorations. Used as a concert hall. 360 seats. 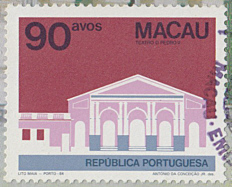 Text: "1º Centenário do Teatro D. Pedro V 1872-1972"
Reverse Text: "Teatro D. Pedro V"
Front Text: "Dom Pedro V Theatre - Macau" - "Macau World Heritage Collection"
Reverse Text: "8. Dom Pedro V Theatre. 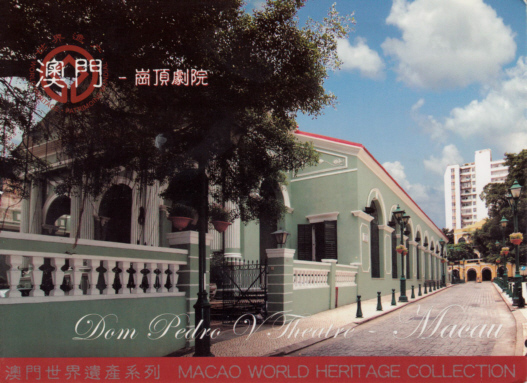 Build in 1860 as the first western-style theatre in China, with a seating capcity of 300, it has survived as highly significant cultural landmark in the context of the local macanese community and reamins a venue for important public events and celebrations."